Dr. Parnell will present standard EMDR protocols in addition to modified protocols to work effectively with this very challenging population. Victims of early abuse may easily become distressed, dissociated, or avoidant. EMDR therapists may need a specific and advanced understanding of the EMDR method, as well as additional skills, to work with them successfully. Topics addressed during the day will include: how to modify standard EMDR procedural steps with patients abused as children when necessary; developing appropriate targets; recognizing and dealing with blocked processing; using interweave strategies, working with abreactions, dissociation and memory chaining; and much, much more. Participants will leave with an array of new insights, ideas, perspectives, and techniques that will help them be more effective with victims of childhood abuse. Describe the five basic principles of Attachment‐focused EMDR and how they can be integrated into the treatment of relational trauma. Repair early developmental stages using imagination and bilateral stimulation. Describe four ways to integrate an attachment‐focus into the desensitization, installation, closure and reevaluation phases of EMDR. Describe how and why to adapt the standard EMDR protocol for clients with attachment wounds. 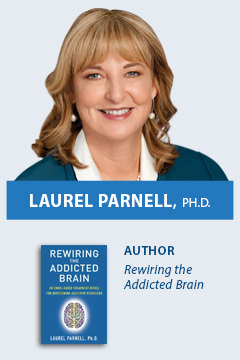 Laurel Parnell Ph.D. is one of the world’s leading experts on EMDR. A clinical psychologist, she has trained thousands in EMDR in her international workshops. Dr. Parnell is the author of Tapping In: A Step-by-Step Guide to Activating Your Healing Resources Through Bilateral Stimulation, A Therapist’s Guide to EMDR, Transforming Trauma: EMDR, and EMDR in the Treatment of Adults Abused as Children. An EMDR pioneer and innovator, Dr. Parnell has immersed herself in the practice and development of EMDR bringing a client-centered, attachment-focused approach to the work.